Naples is all about the beach and nature, so don't get stranded miles away from the water. This is your opportunity for a truly unforgettable vacation in paradise. This recent custom home is in a quiet and safe neighborhood and is conveniently located within minutes of Vanderbilt Beach, Mercato's shopping and restaurants, and the Ritz-Carlton. All so close that you don't even need to rent a car! The home has central air and ceiling fans in each room. The large airy and sunny, screened lanai opens onto our private solar-heated saltwater pool surrounded by tropical palms for extra privacy. The oversized kitchen has all you need to prepare anything from an intimate dinner to Thanksgiving for the family! Ask about our 2 RENTAL HOMES on the SAME STREET, great for family reunions, weddings, etc! 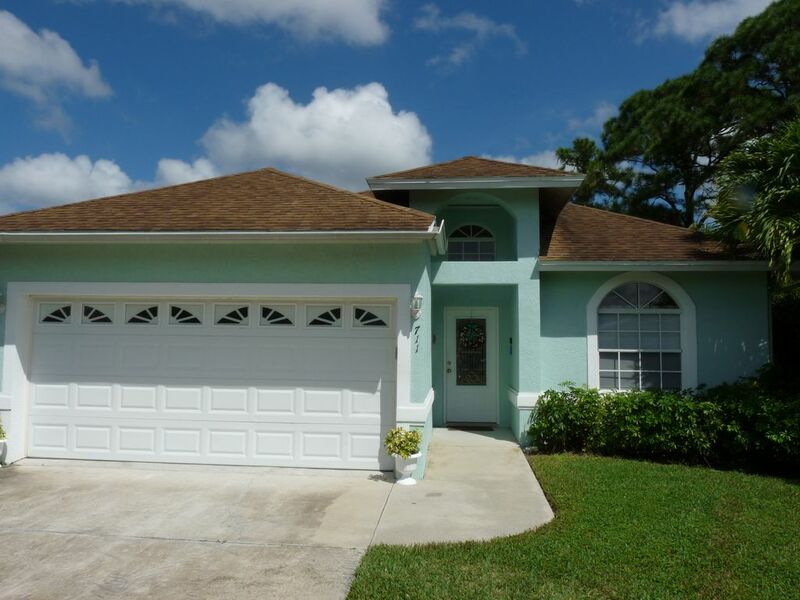 And inquire about our other POOL HOME, CASA BONITA #7635796. Soak up the sun, swim in the crystal clear waters of the Gulf of Mexico, shell the endless sandy beach, or spot wildlife at nearby Wiggins Pass State Park. World-class golf is just around the corner, over 100 courses!. Relax, restore, and rejuvenate! For the more adventurous try deep-sea fishing, water sports of all kinds, or take a ride on the wild side in the Ten Thousand Islands of Florida's famous Everglades National Park! Bring your lover or bring the whole clan, you can even bring the family pet! This place has something for everyone. You're sure to have the time of your lives! Use our other rental homes on the same street for a great family reunion! - Three spacious bedrooms (King, Queen, and two twins). Master bedroom has private bath and separate French doors to the private tropical lanai. 2 Phones, Central Air, Satelite TV, DVD player, CD Player, Full Gourmet Kitchen, Microwave, Dishwasher, Refrigerator, cooking utensils provided, all Linens provided, Washer, Dryer, 2-car Garage, Gas BBQ. 2 bikes (ask if you need more), beach umbrella, beach chairs, cooler and beach toys are all provided. PETS ARE ALLOWED with refundable $75 pet deposit! Swimming in the Gulf of Mexico at Vanderbilt Beach or nearby Delnor-Wiggins State Park, bountiful shelling, boutique shopping, gourmet dining, snorkling, motor boating and sail boat rentals at Vanderbilt Beach, parasailing, jetskiing, biking, tennis, horseback riding, theater and concerts, and of course numerous EXCELLENT GOLF courses! Explore the Ten Thousand Islands with the Park Rangers or experience Corkscrew Audubon Sanctuary for marvelous REAL FLORIDA! Naples Nature Conservancy/Wildlife Rehab. Center and Jungle Larry's Carribean Gardens are just 10 min. away. Peter and Cate custom designed and built this exquisite home in 2002, new solar heated salt water pool added in 2014. We are avid nature lovers, Peter is a nature guide and very knowledgeable birder. We offer (when possible) boat rides out to Keewaddin Island, only accessible by boat, a nature lovers beach paradise! Dolphins, sea turtle nesting areas, wonderful birding and more! We live here full time with our standard poodle on two tree-studded acres, 6 miles from our rentals. Always ready to answer any of your questions! This house was designed for easy accessibility and privacy within and without. None of the bedrooms share a wall with any other bedroom. The master has its own access to the spacious screened lanai and pool. The swimming pool is surrounded by tropical foliage to create a peaceful, serene, restful place for lounging, reading, and dining al fresco. Exterior windows are screened with palms and other foliage to complete this retreat. We live right here in Naples full time. The single best reason to come to Naples is the beautiful beach, great golf courses and nature lovers paradise. The single best reason to rent Blue Heron is that you can get there on foot, by bike, or by car. We live here in Naples full time and are always happy to answer any of your questions! Beach towels, beach toys, and beach chairs are all provided. Don't get stuck miles from the beach! Consult our extensive booklet, in the house, about the many enjoyable things to do and see! Nearby beaches include Vanderbilt beach, Delnor-Wiggins State Park beach, Barefoot Beach and the Ritz Carlton beach. We have 11 continuous miles of public beaches! The warm waters of the Gulf of Mexico are the ultimate attraction in Naples for swimming, boating, watersports, birding and watching the manatees and dolphins!. Not really necessary, but we have central heating! 2 sets of bed sheets for every bed! Lots of towels for pool and beach! Wireless broadband DSL, bring your devices! lots of Bath, pool and beach towels provided. Everything you need in a full sized kitchen, service for 8. All the gourmet gadgets you might need! Pool and Beach toys are in the garage. Other age appropriate toys on request. Beach chairs and cooler. within a couple of miles, over 100 great courses! No charge for pets, only a small REFUNDABLE deposit. We will be happy to have baby equipment in the home at your request. The home was only a two minute drive from the beach. Two minutes from kayaking and three blocks from restaurants and shopping. The home is in perfect condition. The pool is great for kids and the home is stocked with everything and anything you can think of. The hosts are fantastic. My family and I were in Naples for my sons wedding. We rented this home so we could all be together in a relaxing atmosphere. This home far exceeded our expectations. We were all very comfortable and felt at home in this beautiful home. We all enjoyed the comfort of the home as well as the heated salt water built in pool. If we have the opportunity to visit Naples again we want to stay in this beautiful home again. Blue Heron was a great home for our trip. We enjoyed the pool and proximity to the beach and stores. There were six of us and plenty of room to spread out or have dinner together. The home had everything you would need for a stay. We would definitely stay again! This is our second stay at Blue Heron and it's like being home, only with no snow, and a pool in the backyard! Cate and Peter are responsive to any question or issues, although we have not experienced any problems. The boat trips from Tin City in Naples, especially the Eco tours and sunset trips are great. We generally do not go too far. Why leave a salt water pool and large screened lanai to hassle with crowds?! Neighbor is friendly and safe. Great place! Great location and value. One of the most affordable rentals in Naples Park. Walking or biking distance to beach and restaurants. Cate and Peter are close by if needed, and are gracious, friendly and very responsive hosts! Don't get stuck miles from the beach! Our 'Blue Heron' home with a NEW POOL 2014 is located within an easy walk to Vanderbilt Beach. Our spacious three/four bedroom home, with two baths, was custom designed and built in 2002. It is only a few doors away from two of our other rental homes, making the three homes an ideal setting for a family reunion or wedding guests. The master suite with a king bed and ensuite bath has it's own private hallway. The two guest bedrooms, off a separate hallway share a full bath. One guest bedroom has a queen bed; the other has two twins beds. The fourth bedroom has a Queen hide-a-bed and 2 closets and is furnished as a den/TV room. French doors from both the Great room and Master suite lead out to the new pool and a sunny @ 30'X30' lanai and a lush, private, tropical backyard. The sugar sands of Vanderbilt Beach are an easy walk or bike ride away. All your home, pool and beach needs are provided, beach chairs, umbrella etc....just bring your swimsuit! Lots of beach towels, and bath and 2 sets of sheets for each bedroom. 5 Minutes to the beach, shops, movie theater, golf, restaurants, tennis courts and library!